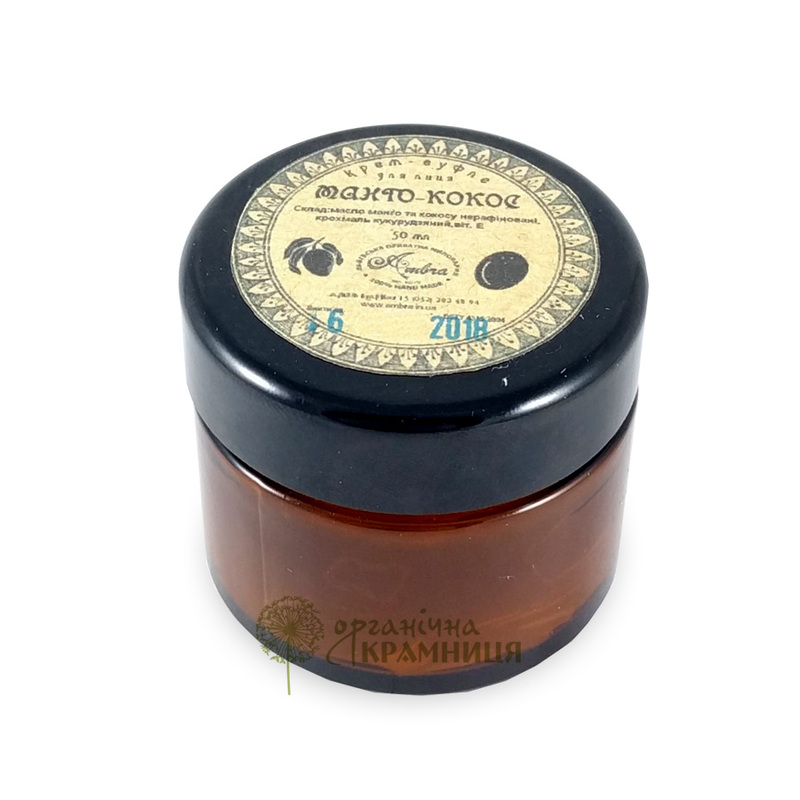 Mango & Coconut Facial Soufflé Cream is produced by the Ukrainian cosmetic brand Ambra (Lviv Private Soap Factory). It's a remarkably delicate, 100% natural skincare product. The cream is handmade and contains only natural ingredients (unrefined vegetable oils, maize starch and vitamin E). Unrefined mango seed butter is rich in fatty acids such as stearic acid, palmitic acid, oleic acid, arachidic acid, and linoleic acid. It also contains vitamins A, B, C, D and E, iron, magnesium, calcium, and potassium. As a result, mango seed butter helps to keep the skin healthy and conditioned. It has photoprotective, softening, moisturising and regenerative properties. This ingredient prevents premature wrinkles and rough skin, improves skin elasticity, and keeps your face looking refreshed and glowing. Unrefined coconut oil is another important ingredient of Ambra's facial soufflé cream. It is high in lauric acid, myristic acid, palmitic acid, capric acid, oleic acid, stearic acid, linoleic acid, vitamins A, B1, B2, B3, C, E and K, phosphorus, calcium, and iron. Coconut oil effectively protects the skin against harmful environmental factors, prevent dry and flaky skin, relieves irritation and sunburn, keeps the skin nourished and hydrated. Directions. Apply onto cleansed skin, massage until absorbs. Blot the residue with a paper towel if necessary. Ingredients. Mangifera Indica Seed Butter, Cocos Nucifera Oil, Zea Mays Starch, Tocopheryl Acetate. Want to buy Mango & Coconut Facial Soufflé Cream? Call us or submit your order via our web site! Ambra is a Ukrainian cosmetic brand owned by the Lviv Private Soap Factory, a small family-owned company that produces handmade, natural cosmetics. The company is based in the city of Lviv. It was founded in 2010 as a small, privately owned manufacturing enterprise that produced exclusive handmade soap. Today Ambra offers consumers a wide range of personal care products including soap bars, liquid soap, hammam soap (also known as beldi soap), solid shampoos, cosmetic butters and oils, body scrubs, lip balms, and more. The motto of the Lviv Private Soap Factory is “Naturae convenienter vive!” which translates into English as “Live in accord with nature”. To bring this motto to life, the company formulates its soaps and other products with high-quality, 100% natural ingredients (vegetable and essential oils, herbal extracts, sea salt, beeswax) and uses only those techniques that help to better preserve the benefits of natural ingredients. Ambra cosmetics are free of artificial colourants, preservatives, fragrances, emulsifiers, surfactants, and other potentially irritating or harmful synthetic ingredients. Each product branded as Ambra contains only a bare minimum of natural ingredients like oils, spices, medicinal herbs, beeswax, honey and propolis, which is nevertheless enough to take good care of your skin and hair. All products are safe for human health which is confirmed by quality certificates issued by the Ministry of Healthcare of Ukraine.